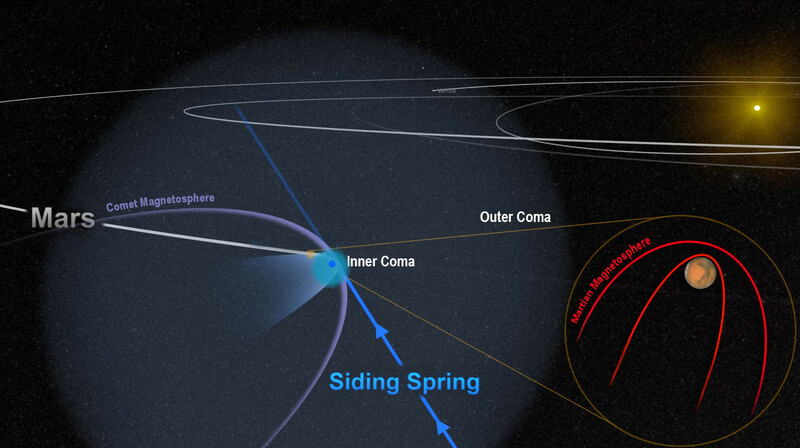 The close encounter between comet Siding Spring and Mars flooded the planet with an invisible tide of charged particles from the comet’s coma. The dense inner coma reached the surface of the planet, or nearly so. The comet’s powerful magnetic field temporarily merged with, and overwhelmed, the planet’s weak field, as shown in this artist’s depiction. Illustration credits: NASA/Goddard. Just weeks before the historic encounter of comet C/2013 A1 (Siding Spring) with Mars in October 2014, NASA’s Mars Atmosphere and Volatile Evolution (MAVEN) spacecraft entered orbit around the Red Planet. To protect sensitive equipment aboard MAVEN from possible harm, some instruments were turned off during the flyby; the same was done for other Mars orbiters. But a few instruments, including MAVEN’s magnetometer, remained on, conducting observations from a front-row seat during the comet’s remarkably close flyby. The one-of-a-kind opportunity gave scientists an intimate view of the havoc that the comet’s passing wreaked on the magnetic environment, or magnetosphere, around Mars. The effect was temporary but profound.